Last week when making a frame out of old toys, I thought it would be great to make some push pins out of the old Lego figures. These Lego figure push pins went really well with the frame. 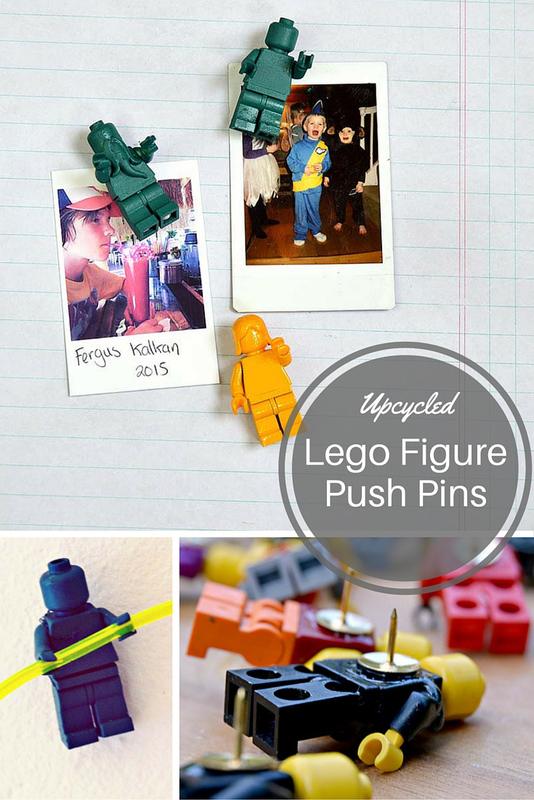 We liked these lego figure push pins so much, that we decided to make more for other projects. 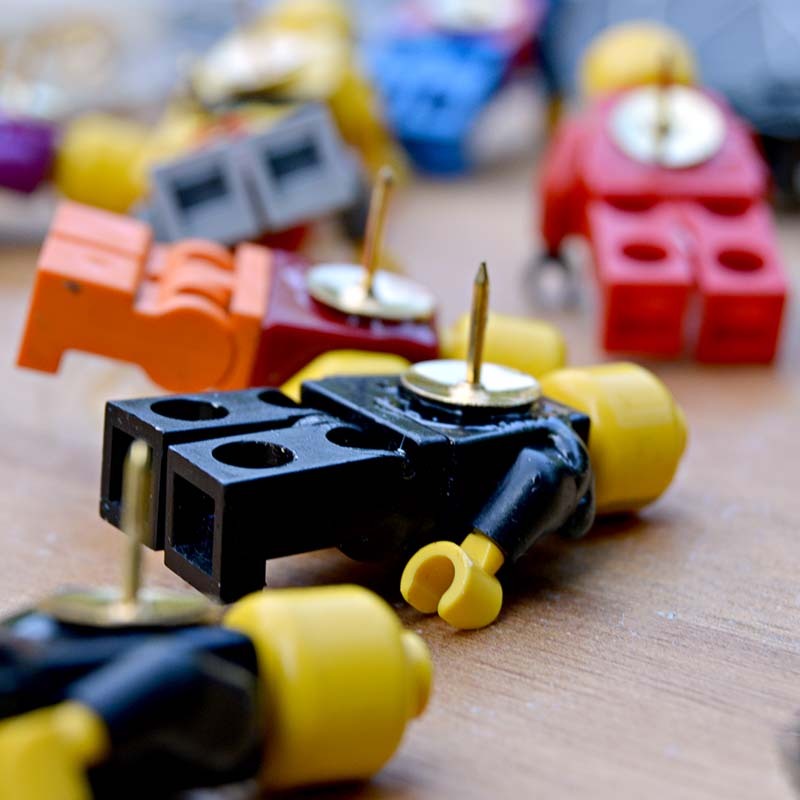 Not only do Lego figure push pins look fun, they also have an added special feature in that their hands act like clasps. These hands are great for grasping thin wires and string, they can be twisted into different positions and the arms can be moved as well. With this feature, we were able to use them decorate a wall with electro-luminescent (EL) wire. Firstly glue the top of the flat head drawing pins to the middle of the back of the lego figures and leave to dry, preferably overnight. 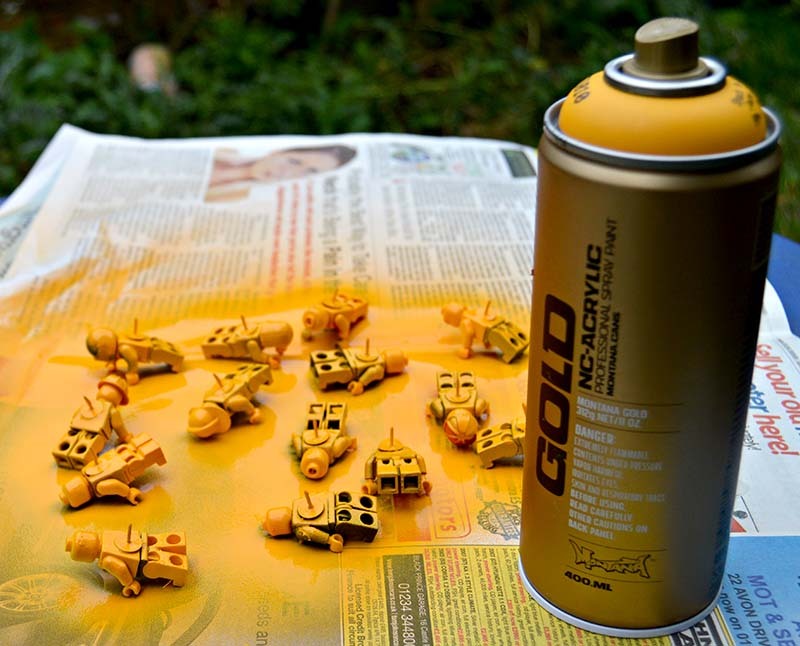 Once the glue has dried, spray paint your figures. I used 2 colours for my pins; one lot in yellow and another in teal. You’ll have to spray the front of the figures first and then when they are dry, turn them over and spray paint the backs. Your pins are now ready to use. Dead simple ! 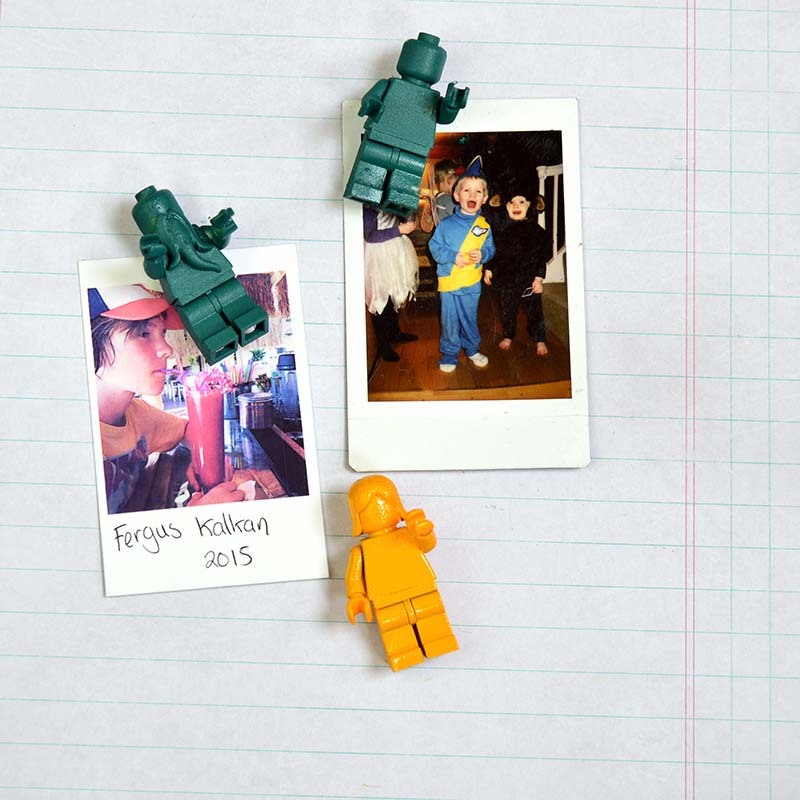 How to use Lego figure pins to create luminescent wall art. Over the summer we’ve been giving my sons room a revamp with a cactus theme and as part of the decoration we decided to create some luminescent wall art. This turned out to be really simple to do. To start with, I bought 3 metres of green neon 3.2mm thick EL wire off ebay. EL wire is relatively cheap and is available in several different lengths and colours. It’s basically a plastic coated copper wire that glows when plugged in, like a skinny neon light. It’s also really flexible and you can manipulate it into any shape, but you do need something to hold it in that shape. 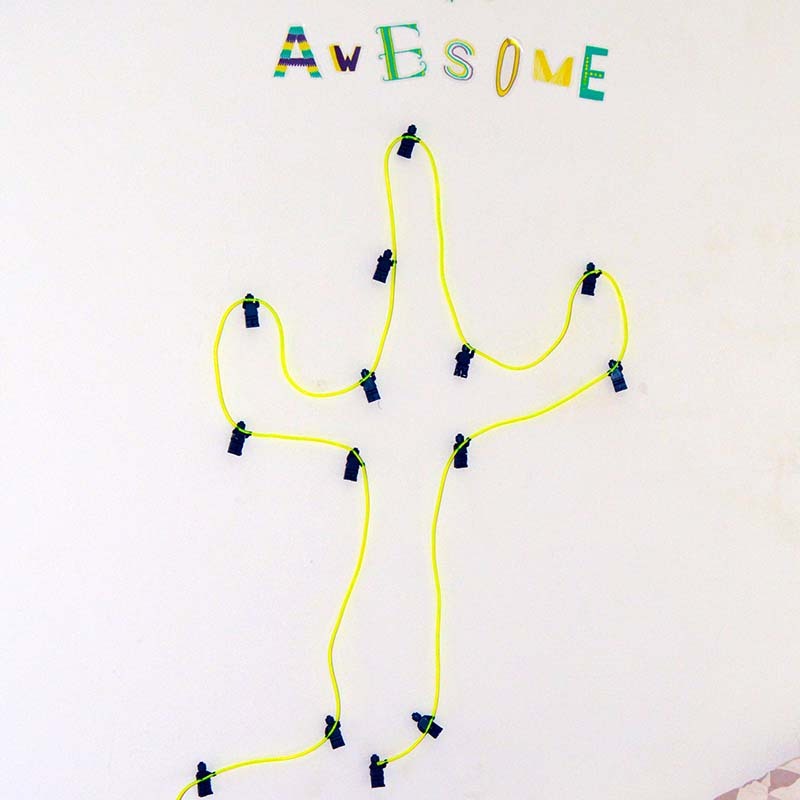 In keeping with the cactus theme, we used the lego figure push pins to hold the EL wire in the shape of a cactus on the wall. They were perfect for this as their hands gripped the wire nicely. 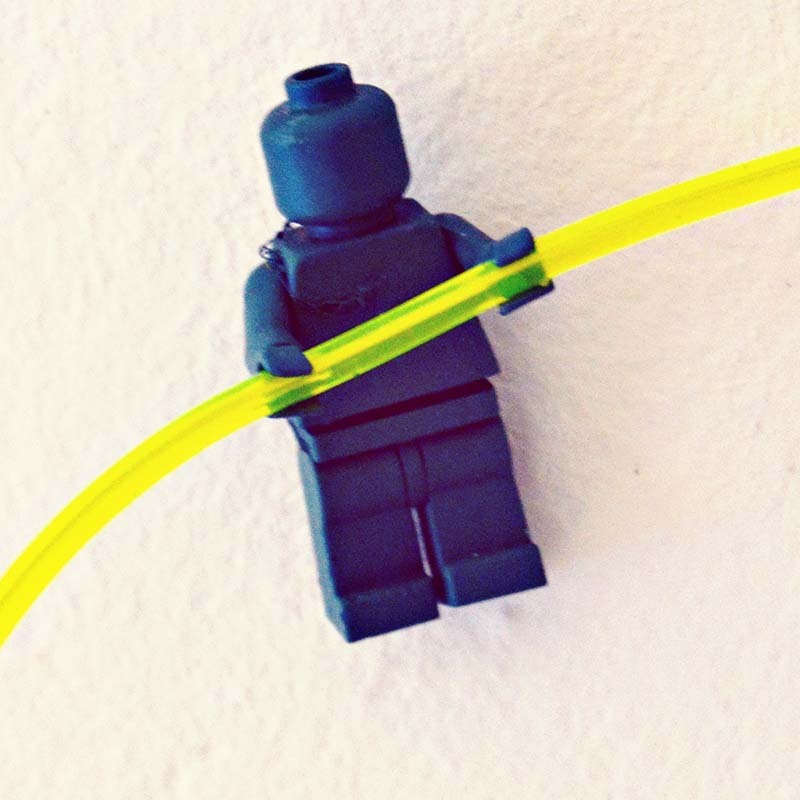 The Lego push pins can also be rotated at different angles and the arms of the figures can be manipulated, making it really easy to position the EL wire anyway you want on the wall. My son loves his illuminated cactus decoration and is now thinking about installing another EL wire decoration in his room. This cool wire comes in loads of colours and lengths so the possibilities are endless. I think we’ll be buying some more wire very shortly and have some illuminated decorations around the house just in time for Christmas. If you like this you might also like my upcycled map magnetic board and travel pins. Great idea for recycling legos!!! Thank you, with 3 boys I have lots of spare lego. Very cute! Thanks for sharing at My Flagstaff Home! Oh how fun! That EL wire sounds really cool – what boy wouldn’t love that? Thank you, yes he does love it and wants some more. LOVE this idea!! The pushpins are so cute and fun! Thank you ! Having 3 boys there is no shortage of Lego figures especially now that they have grown out of playing with it. So it’s great to find another use for them. Fantastic, I am a pack rat, so now you’ve got me inspired to save even more! thanks for sharing on craft schooling Sunday! Thanks ! i have a big jar of Lego figures ready for suture projects. 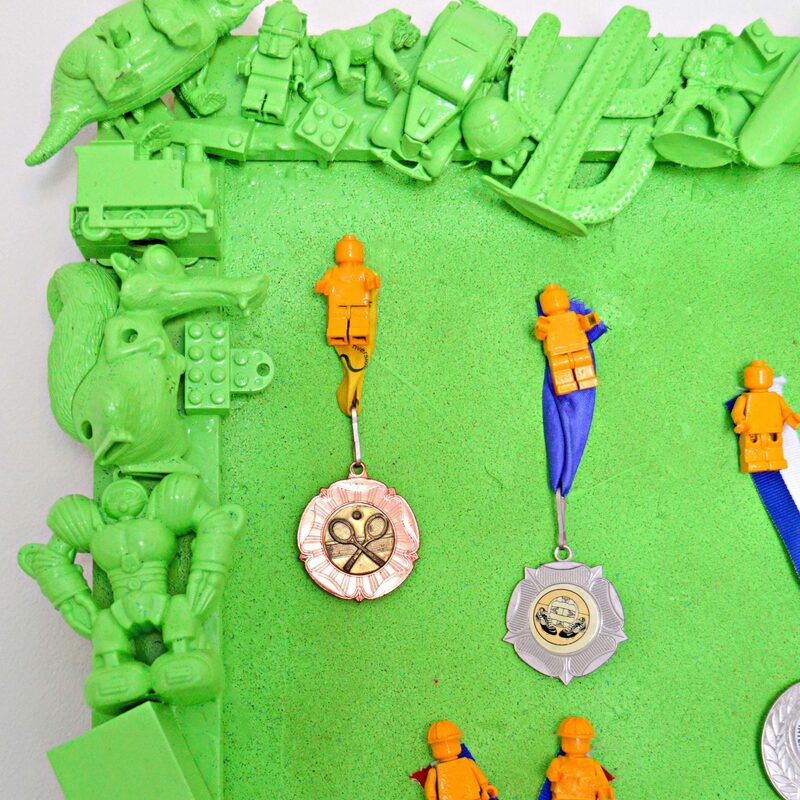 Love these – I’m sure your son is loving them too! At first I thought they were magnets, which is another fun idea! Thanks for sharing at the #HomeMattersParty – hope to see you again next week. Thanks ! Magnets would be a good idea too so you could use them on the fridge, but at least with the push pins you can use them on the wall.